This post was written by Jennifer Hayner, who completed a semester long internship processing and preparing for digitization a significant portion of the Vivien Kellems Papers pertaining to Ms. Kellems’ congressional and gubernatorial aspirations. Ms. Hayner completed her MLIS degree at Simmons University in May 2018. Given the current political climate and the recent 2018 mid-term elections, Vivien Kellems’ anti-tax stance is particularly resonant. In an era of tax cuts for billionaires, is it any wonder that the issues Kellems represents are on the mind of many? 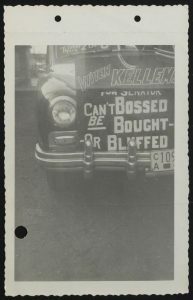 Vivien Kellems, out-spoken Republican, feminist, activist, and Connecticut business owner drew America’s attention in 1944, when she protested the newly formed ‘Victory Tax’. The Revenue of Act of 1942 proposed the Victory Tax in part as a way to help finance World War II. It changed the way Americans were taxed. Gone was the annual lump sum tax payment that most citizens were used to. In its place, a withholding tax was introduced that required businesses to hold back revenue from employee paychecks and send it directly to the IRS. After Kellems announced her decision to stop paying her income tax, she was publicly derided for not supporting the country during the war. This did not stop her from raising the hackles of the IRS once again to protest the withholding tax. To make her point, Kellems began to not withhold her employees’ taxes in 1948. Kellems was feisty from the start. She was born on June 7, 1896 in Des Moines, IA, to parents who were preachers. Vivien was the only girl out of seven children. She graduated from the University of Oregon with a B.A. (1918) and M.A. (1921, Economics). While there, she was the only woman to make the debate team. In 1927, Kellems went into business with her brother Edgar who patented a cable grip he had refined. Together, they founded Kellems Grips, Inc. in New York City. She eventually served as president of the company for over 30 years. Did you know Vivien Kellems ran for public office in Connecticut six more times? In 1950, Kellems ran for a seat in the Connecticut State Senate as an Independent against the incumbent, Senator William Benton (D), and Prescott Bush (R). She announced her candidacy at a Connecticut chapter meeting of the ‘Minute Women’, a conservative grassroots organization of politically active women founded by Kellems and the fiery and controversial Suzanne Stevenson in 1949. The Minute Women were anti-communist upper middle and upper class suburban housewives who fought to preserve traditional moral values and not pay their taxes. They were against universal health care and integration and very much for the oil industry, Joe McCarthy, and patriotism. While many of the women hailed from Texas, there were plenty of members from the wealthy enclaves of Connecticut. When they weren’t busy heckling their opponents, they were pushing anti-Semitic and anti-New Deal literature written by extreme right-wingers John T. Flynn, Joseph P. Kamp, and Dr. John O’Beaty. (Huret 2014) Many of the groups’ activities were shrouded in secrecy for fear of communist infiltration. While Kellems was decidedly pro-McCarthy and anti-New Deal, it is hard to imagine that she did not grapple with the implications some of their activities. While the Minute Women initially backed Kellems’ run for Senate, Stevenson, in particular, wanted her to run as a Republican, not an Independent. When Kellems refused, the organization denounced her and she left group. In the end, Kellems failed to gather the required petition signatures that she needed in order to get on the ballot. Kellems never gave up. She persevered and ran again in 1952 for the Senate as an Independent Republican against incumbent William Benton (D), William Purtell (R), and socialist and Mayor of Bridgeport, Jasper McLevy. This time she made it onto the ballot and gathered over 22,000 votes in the race, beating McLevy. She had help from the Liberty Belles, an organization founded by Kellems in 1951 to seek the repeal of the withholding tax. The Liberty Belles were an ardent force, supporting Kellems in her political endeavors by writing letters and sending her donations to finance her campaign. Men could join the group as ‘Liberty Boys’, but this really was a pro-woman organization that advocated for women’s rights, and equality at home, at work, and in society. 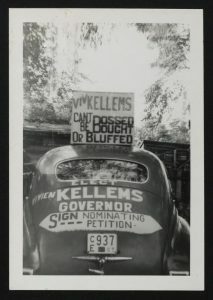 The issues drove Kellems to run for governor of Connecticut in 1954 as an Independent Republican and as a Republican since candidates could run on two different tickets. Connecticut was one of the last states to still have a party lever on their voting machines. Kellems had advocated destroying the party lever for years, stating that they were illegal. If voters wanted to split their votes between parties, they first had to pull a party lever and wait for a bell to ring. She was in favor of a direct primary system as well. Kellems considered a vote for her a “protest vote” against the “political bossism” of the Connecticut convention system. In a close race between the party nominees, Kellems drew voters away from the incumbent John D. Lodge (R). Abe Ribicoff (D) won the governor’s race, beating Lodge, Kellems, and McLevy. Kellems used the media, both radio and television, to educate and captivate potential voters in many of her campaigns. The media proved to be very useful in the 1956 and 1958 campaigns when she had to ask supporters to sign petitions so that she could get on the ballot. 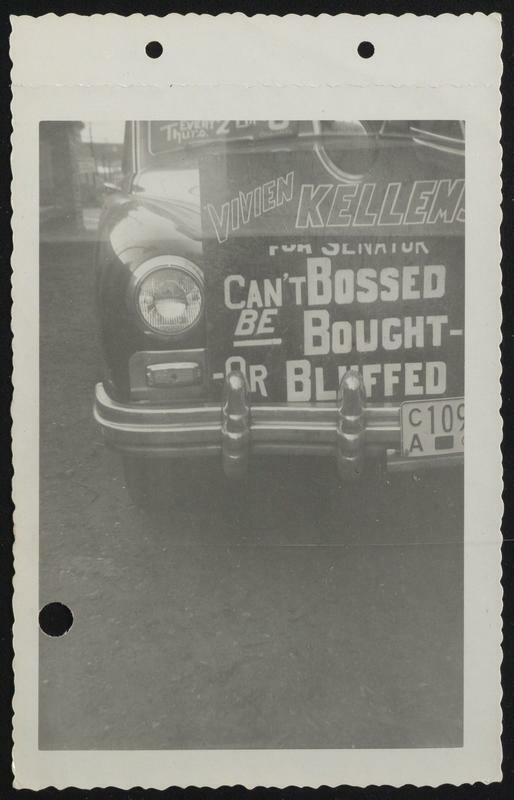 In her ‘56 Senate campaign, Kellems requested that she receive the same amount of air time as her opponent, incumbent Prescott Bush (R). Some stations agreed with her, while others defiantly did not. Kellems could not run as a Republican because at the time the state did not allow same party candidates to run against an incumbent. She had to battle Connecticut Secretary of State Mildred P. Allen in court to get onto the November ballot as an Independent. Allen refused to approve and certify Kellems’ nominating petitions, saying many of the signatures were forged. Kellems prevailed, and ran against Bush, Thomas Dodd (D), Minute Woman Suzanne Stevenson (IR), and Jasper McLevy (SP). Bush won the race. Vivien Kellems ran for Senate in 1958 and 1962. She ran as an Independent in ’58 against incumbent Senator Purtell (R) and Thomas Dodd (D) who won the race. In the 1962 election, Kellems ran for the GOP nomination against Rep. Horace Seely-Brown and former Gov. John D. Lodge. Kellems withdrew from the race at the convention. Brown lost the election to Democrat Abe Ribicoff. For the rest of her life Kellems fought the system. She never gave up on her fight against the income tax or the unfair taxation of single people. She fought government fraud and corruption at every level. She believed in the power of women and wanted more women in political offices. Kellems devoted the rest of her life to women’s rights and gender equality. She died on January 25, 1975 at 78 years old. To find out more about Vivien, her political ambitions, and her life-long fight against taxes, please visit the Kellems Papers in the University of Connecticut Library’s Archives & Special Collections digital repository. Arizona Republic. 1942. “Women politcal enemies wage ladylike campaigns.” Arizona Republic. Phoneix, AZ, 09 12. Accessed 2018-05-03. https://www.newspapers.com/image/116789645/?terms=kellems+and+luce#. Huret, Romain D. 2014. American Tax Resisters. Cambridge: Harvard University Press. Vivien Kellems is a stanchion of Connecticut history. 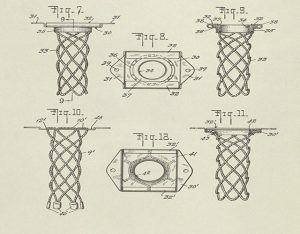 She ran the Westport-based company Kellems Cable Grips Inc. which produced and sold the revolutionary invention patented by her brother: an endless-weave cable grip to secure electrical and bridge cables. Ms. Kellems also became a prominent political figure running for senate and governor as well as repeatedly speaking out for tax and voting reform. 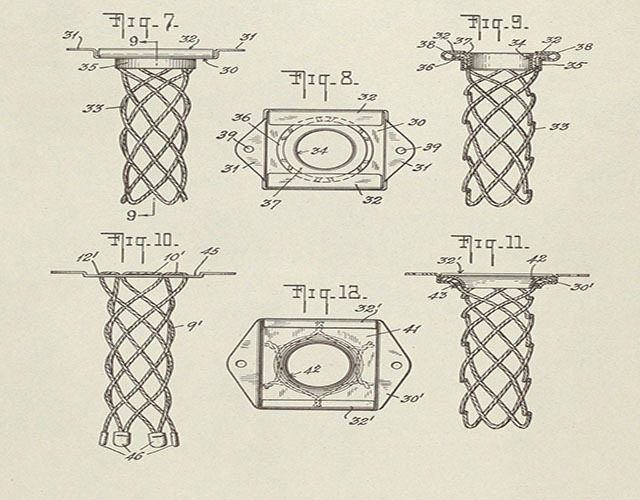 Patent for cable grips – Edward Kellems. Occasionally work in the archives requires a bit of a detective edge. We come across papers and objects that we’re not quite sure how to describe or what their original purpose may have been. Such was the case recently while processing the Vivien Kellems Papers when I came across a set of peculiar items. Although I knew The Kellems Company produced extremely large cable grips for buildings and bridges, I was perplexed to find a set of very small ones. Finger cable grip manufactured by Kellems Cable Grips Inc. The answer was found in a piece of correspondence within the collection. These small cable grips were sold to hospitals and used to stabilize injured fingers. When they are slipped onto the finger and tension is applied to the metal tab at the end, the wire mesh gently tightens allowing the fingers to be suspended and secured while they healed. Cable grip for the pinky finger manufactured by Kellems Cable Grips Inc.
Vivien Kellems also promoted the use of small cable grips in the home for such purposes as securing taper candles in their holders. An innovative and interesting woman, Vivien Kellems is certainly a rich character in Connecticut’s history. Be sure to check out the rest of her collection in our digital repository here which is being added to as this collection is processed.